Messier 15 (M15), also known as the Great Pegasus Cluster, is a globular cluster located in the northern constellation Pegasus. The cluster has an apparent magnitude of 6.2 and lies at a distance of 33,600 light years (10,000 parsecs) from Earth. It has the designation NGC 7078 in the New General Catalogue. Messier 15 is one of the oldest known globulars in our galaxy. It has an estimated age of 12 billion years and only 1 percent of the Sun’s iron content. The cluster has an absolute magnitude of -9.2, which makes it about 360,000 times more luminous than the Sun. Messier 15 has an apparent diameter of 18 arc minutes, corresponding to a linear diameter of about 175 light years. The tidal radius of M15 spans 21.5 arc minutes, or about 210 light years from the cluster’s centre. 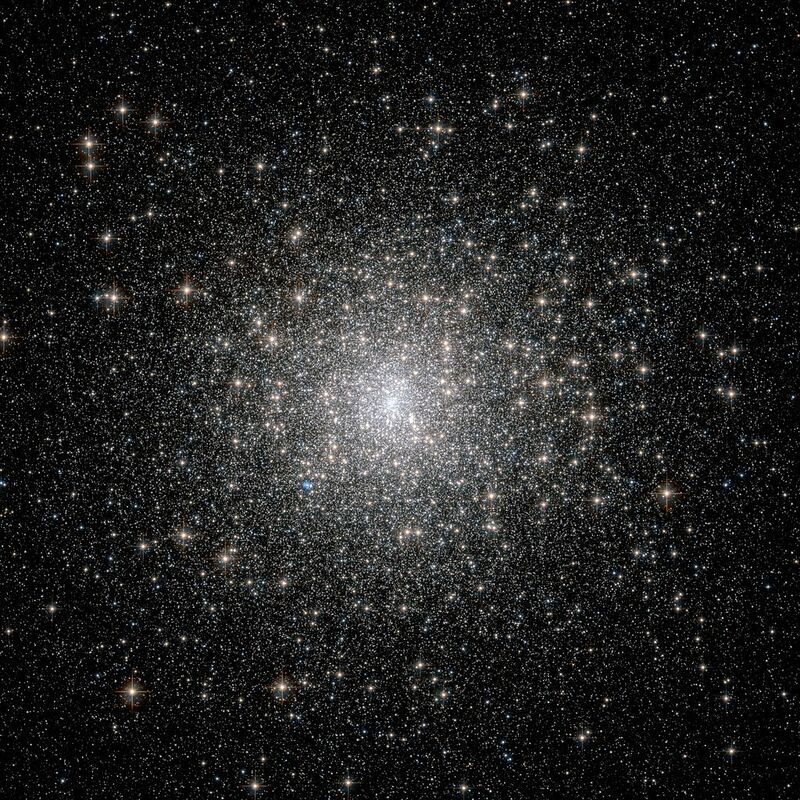 Messier 15 has a density classification IV and is one of the most densely concentrated clusters of its kind. The cluster is notable for its steep central cusp, with an exceptionally large number of stars orbiting what is likely a central black hole. The central density cusp is a result of the cluster having undergone a core collapse, a contraction of its core region. 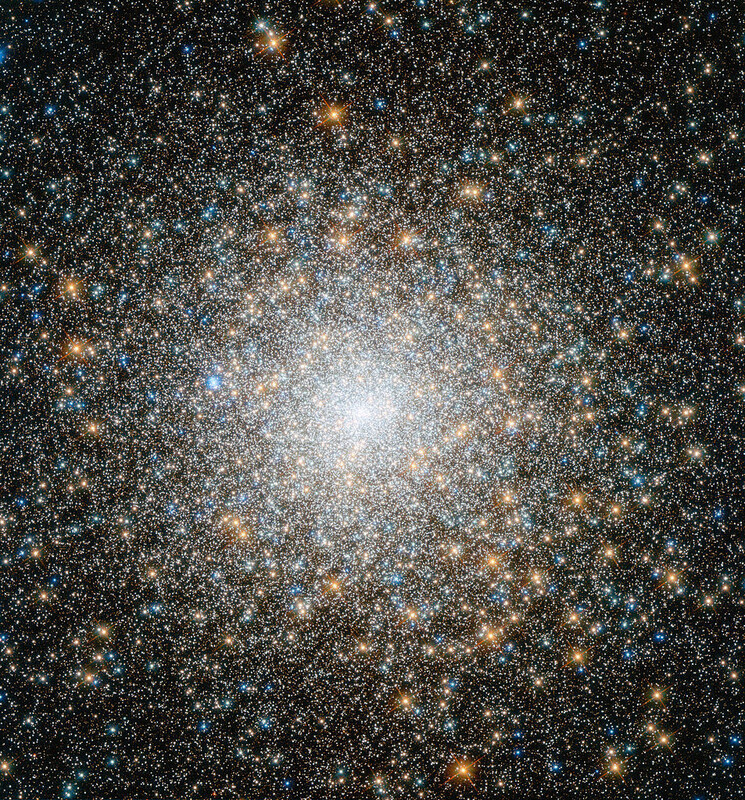 This is a common occurrence in globular clusters as they evolve: Messier 30 and Messier 70 also contain a collapsed core. 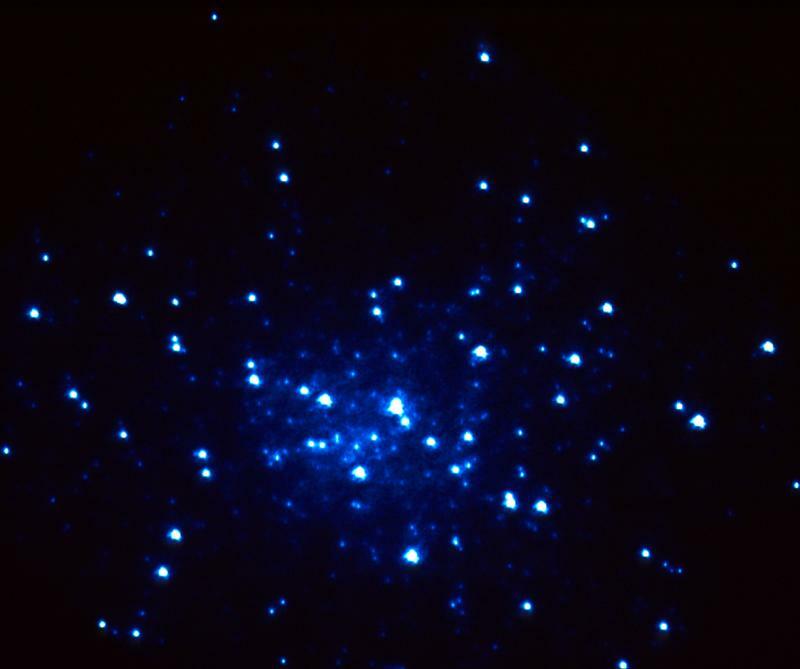 A total of 21 of the 157 known globular clusters in the Milky Way, and possibly 8 more, including Messier 62 and Messier 79, have undergone a core collapse. 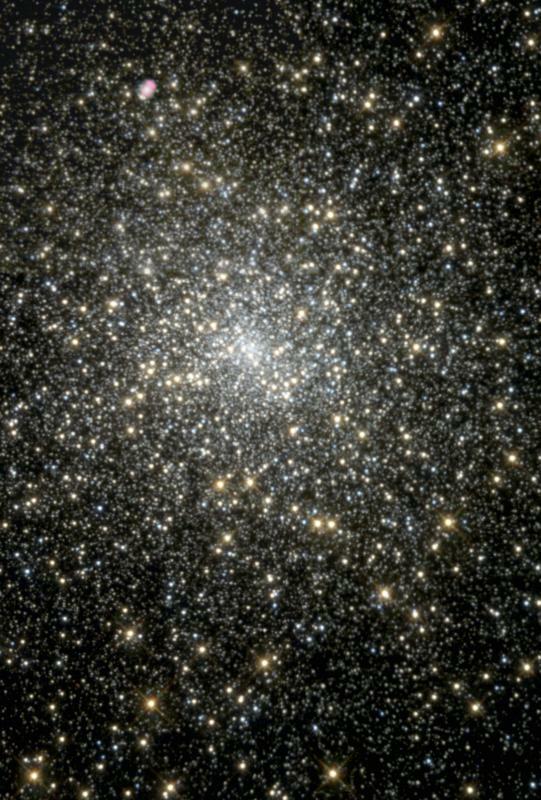 The core of Messier 15 is very small – about 0.14 arc minutes or 1.4 light years – compared to the cluster’s size. Half the cluster’s mass is concentrated within the central 10 light years, or 1.06 arc minutes. Scientists have theorized that either the cluster contains a supermassive black hole at its core or the concentration of mass is a result of the gravitational interaction of the stars in this area. 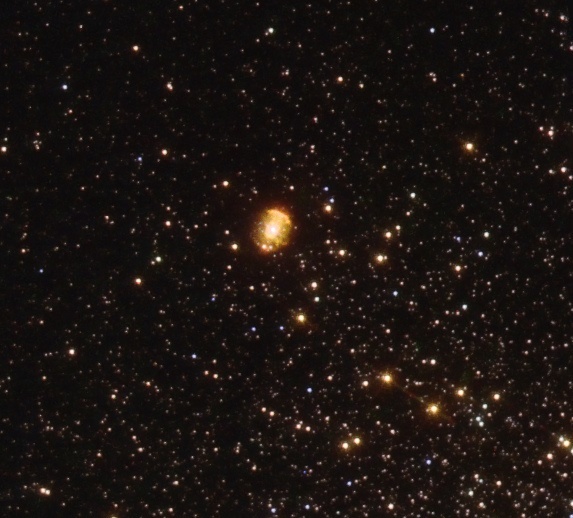 A survey of the cluster’s inner 22 light years alone revealed about 30,000 stars. The cluster contains more than 100,000 stars, including a considerable number of variables (112) and pulsars (8), neutron stars formed in supernova explosions that occurred when M15 and the universe itself were still young. The only other globulars with more known variables are Messier 3 and Omega Centauri. 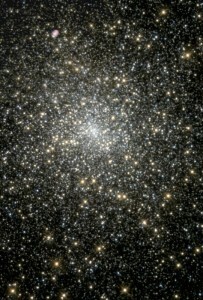 Omega Centauri, the largest globular cluster in the Milky Way Galaxy, is not included in Messier’s catalogue. The brightest stars in M15 are of magnitude 12.6. They have an absolute magnitude of -2.8, which makes them about 1,000 times more luminous than the Sun. M15 is approaching us at 107 km/s. Messier 15 is home to a double neutron star system, designated M15 C, and the first ever planetary nebula discovered in a globular cluster. The nebula, Pease 1 (K 648), was first observed in 1928. It is one of only four nebulae discovered within globular clusters. It was named after Francis Gladheim Pease, the American astronomer who discovered it. The nebula occupies an area 3 arc seconds in size and has a visual magnitude of 15.5. Two bright sources of X-ray emissions have been detected in M15 by the space satellites Chandra X-ray Observatory and Uhuru. The sources are designated Messier 15 X-1 and Messier 15 X-2. The first one, also catalogued as 4U 2129+12, is the first astronomical X-ray source found in Pegasus constellation. The dazzling stars in Messier 15 look fresh and new in this image from the NASA/Hubble Space Telescope, but they are actually all roughly 13 billion years old, making them some of the most ancient objects in the Universe. Unlike another recent Hubble Picture of the Week, which featured the unusually sparse cluster Palomar 1, Messier 15 is rich and bright despite its age. Messier 15 is a globular cluster — a spherical conglomeration of old stars that formed together from the same cloud of gas, found in the outer reaches of the Milky Way in a region known as the halo and orbiting the Galactic Centre. This globular lies about 35 000 light-years from the Earth, in the constellation of Pegasus (The Flying Horse). In the night of June 3 to 4, 1764, I have discovered a nebula between the head of Pegasus & that of Equuleus it is round, its diameter is about 3 minutes of arc, the center is brilliant, I have not distinguished any star; having examined it with a Gregorian telescope which magnifies 104 times, it had little elevated over the horizon, & maybe that observed at a greater elevation one can perceive stars: I have compared it with the star Delta Equulei; its right ascension has been concluded at 319d 40′ 19″, & its declination at 10d 40′ 3″ north. I have also marked that nebula in the chart of the apparent path of the Comet of 1764. On September 23 , I found a new nebulous star with the 7-foot telescope, northward between the stars Epsilon or Enif, at the mouth of Pegasus, and Delta and Gamma at the mouth of Equuleus. It shows up as well as of round shape and enveloped in a dense nebula, wherein no stars are recognizable. I determined its separation from Epsilon as 4deg 14′ and from Delta as 4deg 28′. It has about three small stars which are not contained in Flamsteed’s catalog, a position as shown in the fourth figure, the separation of which I have mutually determined with the heliometer. The 15th of the Connoiss. [Messier 15] is perfectly round, and insulated. The accumulation of stars towards the centre is more sudden that the 13th of the Connoiss. [Messier 13] and the scattered stars extend proportionally much farther. Its diameter is 1/6 of the field of the glass which magnifies 108 times, that is to say 4’0″. It passes the wire in 13″.0 of time which by calculation gives only 2’11”.3, but I rely more on the estimation by the known field of view which is 24’0″; because the limits of the cluster cannot be properly fixed upon transit. A globular cluster between the mouths of Pegasus and Equuleus, forming the northern vertex of a triangle, obtuse and nearly isosceles, of which the base is Beta Pegasi and Delta Equulei. This fine object was discovered by Maraldi in 1745, and registered as “une étoile nébuleuse, assez claire, qui est composée de plusieurs étoiles.” Messier could not quite make this out, but in 1764 described it as a nebula with [actually without] a star, its form circular and centre brilliant; and the place he assigned to it is very considerably in error [actually about 20′]. Thus it remained till 1783, when Sir William Herschel resolved it into stars, and found it a good object for proving the telescope’s space-penetrating power; he estimated its profundity to be of the 243rd order. Although this noble cluster is rated as globular, it is not exactly round, and under the best circumstances is seen as in the diagram, with strgglers branching from a central blaze. Under a moderate magnifying power, there are many telescopic and several brightish stars in the field; but the accumulated mass is completely insulated, and foreibly strikes the senses as being almost infinitely beyond those apparent comites. Indeed, it may be said to appear evidently aggregated by mutual laws, and part of some stupendous and inscrutable scheme of involution; for there is nothing quiescent throughout the immensity of the vast creation. 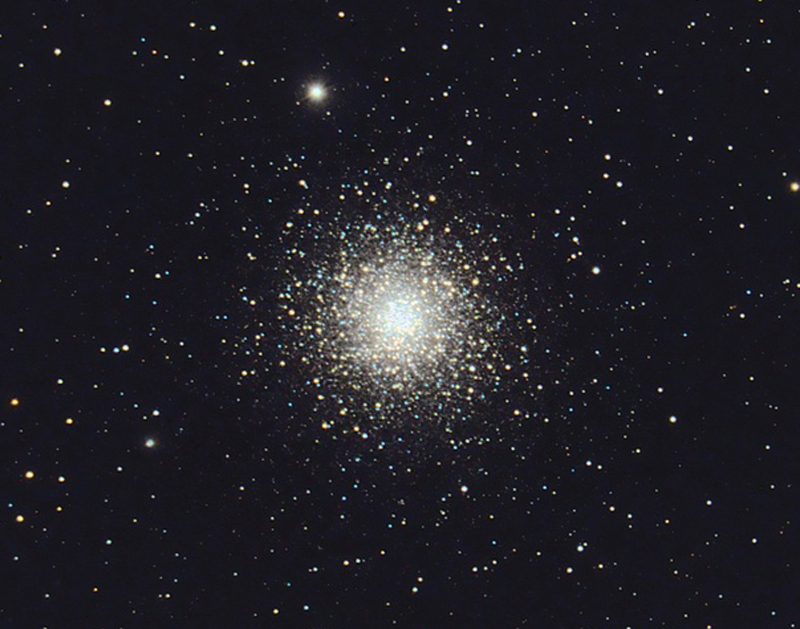 Messier 15 can easily be seen in binoculars and small telescopes, but only appears as a fuzzy patch of light in smaller instruments. The cluster’s stars can be resolved by 6-inch and larger telescopes. Amateur telescopes will reveal an object about 7 arc minutes in size visually. Messier 15 is located 3 ½ degrees west and 2 ¼ degrees north of Enif, Epsilon Pegasi. 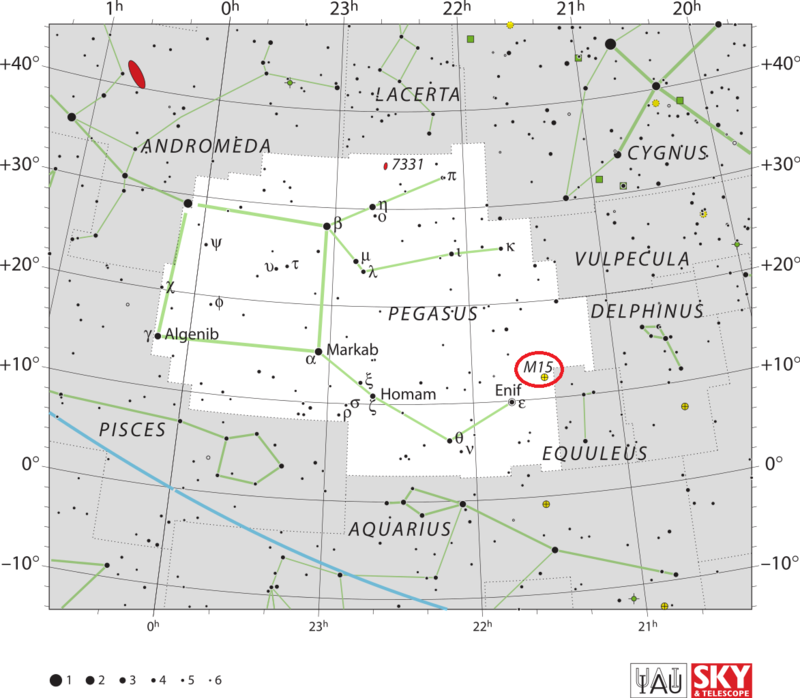 As easy way to find the cluster is to first identify the Great Square of Pegasus, an asterism formed by the constellation’s brightest stars, and then to find the brightest star, Markab, Alpha Pegasi, which marks the southwestern corner. Enif lies about halfway between Markab and the constellation Delphinus, known for its distinctive kite shape.